Kephera pointed out today - Sunday 17 May - that this will be our fifth album recorded at Oakland's Megasonic studio. For Hedersleben it's our third. In fact Dr Strangley Strange even gave their third album Alternative Medicine the subtitle The Difficult Third Album. Perhaps we've avoided the worst of that by planning this album a couple of years in advance and playing some of the songs over the last year? This album is a bit of a gamble really; we've left the safety of the well-received Krautrock style of the last album and pushed forward to a full prog concept album. Yes, there is still a Krautrock flavour running through it, but it’s a much more composed album. The risk is failure to catch a groove; the payoff could award us a wider audience. Megasonic is well stocked with spacious rooms and a competent engineer. It’s not analog, but with enough valve and vintage amps to get a reasonably authentic 70's sound. It’s a five-minute drive from our Oakland practice space where a lot of our equipment is stored. We started late on the first day, mostly setting up gear, and getting sounds. I usually leave Jason on his own for that step. He’s using a small vintage Ludwig kit he bought on tour in 2013. It has a great warm sound. Later on we did get to lay down a couple of backing tracks. 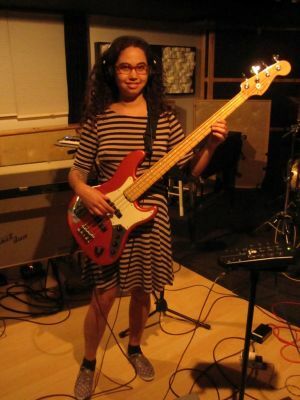 One of which was Ursula's tap bass piece for the Gulf of Lost Souls part of the record. This is the most Krautrock piece of the album and features bass and drums with spacey keyboards, guitar and voice over the top. Day two we tackled An Empire, we're not sure if we got it and might actually need to go back and do it again. This was the mistake we made on our debut album Upgoer, where the main section of the opening track was paced too face. The day was a struggle until about 8:00pm when we recorded both Ghost Armada and Third Time Fleet. Day three is a nose to the grindstone day. A few more backing tracks were laid down including the classical guitar piece Umbul - which I'm not sure we'll use. Half way through the session Kephera is not feeling well, and needs to go home. We have plenty of other stuff to do though: guitar, violin, vocals and we can finish off with shift work. This is not uncommon anyway. On the majority of albums I’ve made the rhythm section don’t stick around for the gruelling overdubs. Studio work is exceptionally tiring if your fingers are not on the board or you are not actively playing. Sunday sees just Ari and I working, Kephera is in the Emergency room. We don't know what is wrong with her. This period seems to be a time of change for everyone in the band. People are moving, in new relationships or changing their life in some way. At least two of the band has no fixed abode. Jai Young Kim (Ex Secret Chiefs 3), spent the day in the studio with us. He's the front-runner for the bass position after Ursula is on maternity leave. He's a fan of the band, a really easy to get on with guy and will be a wonderful musical asset. In addition to bass he plays keyboards and violin but more importantly he’s tour-ready. Tour-ready is a term many people in the business use when considering a new addition to a touring band once you’ve established musical ability. The main elements to be tour-ready are; availability (no 9 to 5 day job), road tested, (have they done major tours without a freak-out? ), no drug or alcohol problems, and no red flag personality traits. We decided to do another take of An Empire later - this time a little slower. Now it's right and we can move on to overdubs of lead vocals and solos. Ari did very well in the studio. She takes direction well and has a great attitude. 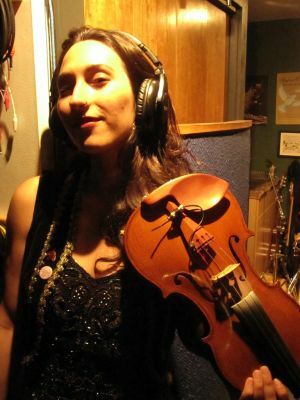 Her pitching and intention on violin has come a long way in the six months she's been in the band. Most of the lead vocals are now done, and we are building connecting parts and intros. Monday morning Kephera is back nursing a virus, not feeling too well but able to work. She’d contracted a chest infection of some sort on the road. We are concentrating today on keyboards to get as much as we can behind us until Kephera needs to rest. 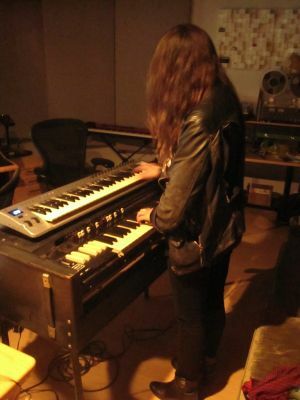 Despite her illness she still managed to attack the Hammond organ sufficiently hard to snap a key (see photo below!). By the evening Kephera is flagging and is clearly done for the day so we continued on with more over-dubs etc. Tuesday is mostly an overdub day with a few building tasks. The biggest question is the groove of some of the songs; it’s become clear that we need to book more time to add some percussion like sandpaper and shakers. Wednesday is our last backing track day. We are finishing up more keyboards and some backing vocals. A few solos and some housekeeping on the tracks. I would have liked to get more time to re-record some of the basic guitar parts that are the original from the backing tracks. By 8:00pm we are running roughs. Normally I like to give it a couple of days before I can get into listening. Nicky details for us the recording of Hedersleben's third album 'Fall of Chronopolis', which is now complete. 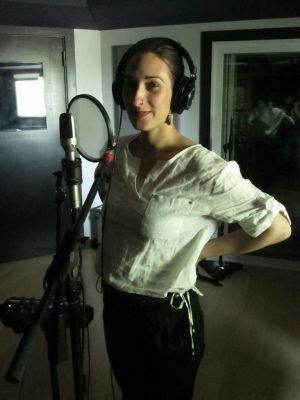 The recording on the third album 'Fall Of Chronopolis' started on May 7th: http://hedersleben.com/news.html"